Join the 24,700+ others that receive AMAZING recipes in their inbox each day! It's FREE! Boneless skinless chicken breasts get stuffed with a combo of feta cheese, roasted red peppers, fresh basil and parsley. It’s a winning combo, for sure! For the last several years or so, I’ve been a little afraid of red meat after hearing about all the crazy health issues it has been tied to. All I have to hear is the “c” word (cancer) and it’s enough to get my attention. Since then, I vowed to eat a variety of protein sources and limit beef to only once in a while. We tend to eat quite a bit of chicken in this house, so I’m always looking for new ways to prepare it (thankfully, the options are limitless when it comes to chicken!). Notes: I chose to roast my own red pepper which was really quite easy, however, feel free to take a little help from the store and buy roasted red peppers in a jar. They are typically found in the condiment aisle by the pickles. Preheat your oven to 450 degrees. Roast the red pepper by placing it on a rimmed baking sheet and cooking it for about 30 minutes. Rotate the pepper every 10 minutes or so until all sides are charred. Remove the pepper from the oven and place it in a paper bag or an air-tight container. Allow the pepper to rest for about 10 minutes or so, then peel off the outer skin and discard it. The skin should peel off pretty easily at this point. Dice the roasted pepper and set aside. Alternatively, you can buy roasted red peppers from the store if you don’t want to roast your own. 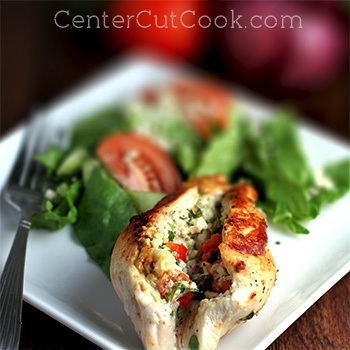 Place each chicken breast in a ziplock bag and use a meat mallet to pound it until it is 1/4 inch thick. Season both sides of the chicken with salt, pepper, and garlic powder. In a small bowl, combine feta cheese, diced roasted red pepper, basil, and parsley. Divide the filling mixture evenly among the four chicken breasts. Place the filling in the center, then fold the sides in and use toothpicks to secure the chicken shut. In a large non-stick skillet, heat 2 tablespoons of olive oil over medium-high heat. Place the chicken in the skillet, and cook for a few minutes on each side, until the chicken is nicely browned. Reduce the heat down to medium and pour in 1/2 cup chicken broth, or enough to cover the bottom of the pan. Allow the chicken to continue cooking for another 8-10 minutes, or until the juices run clear and its cooked through. Remove the toothpicks before serving. Copyright © 2011-2018 CenterCutCook. All Rights Reserved.